The University of East London (UEL) is a university based in the East End of London, England. The university has more than 23,000 students, based at two campuses in Stratford and Docklands areas. The University of East London is one of the leading modern universities in the UK. The institution was formed in 1970 as merger of higher education colleges, including the West Ham Technical Institute in Stratford, and the South East Essex Technical College in Barking.It was initially known as the North East London Polytechnic, and changed its name to the Polytechnic of East London in 1989. In 1992, the polytechnic was granted university status and became the University of East London. Though a "New University", UEL's long and rich history of founding institutions exemplifies the radical developments. University based in the East End of London, Both the Docklands and Stratford campuses have strong transport links. The Docklands campus has its own Docklands Light Railway station. The Cyprus DLR station station of the Docklands Light Railway is directly connected to the pedestrian spine of the campus, and offers links to Canary Wharf, Central London and other various destinations within east London such as Stratford and Excel London. Undergraduate students GBP 1000 will be automatically deducted from their tuition fees Postgraduate students are eligible for a scholarship of upto GBP 2000 which would be automatically deducted from their tuition fees. 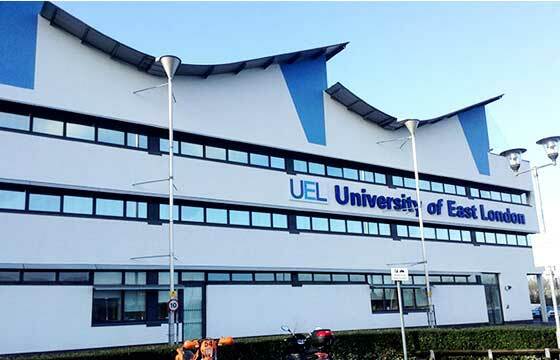 UEL offers both undergraduate and postgraduate degrees. Undergraduate degrees can be either Single Honours or Combined Honours degrees, most of which are available for study on either a full-time or part-time basis. With a Combined Honours degree, a student may choose to study two different subjects in one of two ways.